Another Gold medal for Canada’s women’s ice hockey team, they defeated a very tough USA women’s team 2 to 0, to take their third straight Olympic Gold medal. What made this Gold Medal sweeter was to take this one on home ice in front of not only a hometown crowd and the Prime Minister, but the greatest player who ever played the game who was seated next to Stephen Harper, Wayne Gretzky. While it was widely publicized that the team had spent weeks leading up to the Vancouver Olympic Games playing practice games against boys midget hockey teams . Thanks to an innovative strategy by Alberta Minor Hockey League, the boys teams’ games against the Canadian women even counted in the league standings, giving these teenagers more motivation for pushing the women’s team to improve. What many people did not know about was “Operation Aquarium”. It seems that in a covert move, they arranged two more practice games against Major Midget League teams, this time in secret. They let everyone believe they were taking a team activity to the Vancouver Aquarium, meanwhile they were off to play the Vancouver North West Giants of the B.C. Major Midget League at the Burnaby Winter Club. These games were played before family and friends and kept secret, even the opponents were asked to not talk about the games until after the medals were won. One of the other amazing Bronze Medal stories is Joannie Rochette. Only four days after her mother unexpectedly died following a heart attack and a heart-wrenching short program with a gutsy free skate won Olympic Bronze for her near-flawless skating. In the hearts of Canadian Joannie’s efforts were a Gold Medal effort. While the Canadian women’s hockey team had “Operation Aquarium”, your Canadian small business can have “Operation Telsec”. Your company can have a virtual office Toronto with a prestigious business address, while operating your business from wherever you like. With a Toronto mail service or a Toronto telephone answering service and mail service, your company can give a professional business image to your clients without the cost of a physical office space Toronto. With a telephone answering service Toronto plan, your calls are answered by a professional receptionist who handles your calls to your instructions. You could be working from your home, on the road or even at your cottage, your calls can be answered by your receptionist and transferred to wherever you chose. As your company grows and you need physical Toronto office space or even Toronto shared office space, Telsec can help you upgrade without having to change your telephone number or your prestigious business address. One of the big benefits of being a shared office Toronto client or a office space Toronto client is that you have access to meeting rooms and boardrooms absolutely free. 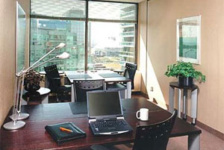 Even Toronto virtual office clients have access to meeting rooms and boardrooms at a very nominal fee.